What is a National Dish of your country that is Paleo? Most of the posters to this forum seem to be from Anglo countries (in other words, one of the least interesting cultures in terms of culinary arts). However, for those who come from non-Anglo countries or from an ethnicity with a particular cuisine, could you please post a recipe of your cuisine that is Paleo. Hope this hasn't been asked before (did a search). If it has, I am sure the Paleo police will swoop down on it. At the coast they would probably say that lutefisk and torsk is the national dish, but the official norwegian national dish is får- i-kål. Torsk (cod) is nice, but I wouldn`t say that lutefisk is paleo. It taste like crap, and is treated in a very non-paleo way with all the "lut". When I think of Canadian meat I think of Winnipeg smokies and chopped ham sausages. And viande fumee from Dunns in Montreal. But what about lutefisk and torsk? With melted butter, salt and pepper. I was taught that only swedes put flour in the butter. I asked about poutine gravy to take back to the US when I was in Ottawa. The clerk pointed to the rack of instant gravy mixes. Hmmm. Yeah, some good fresh blood sausage and liver sausage. Maybe some pork knuckle or sauerbraten. My exposure to Scandinavian foods is mostly through Ikea :-) I noticed that pretty much every food they sell has sugar in it, including the marinated herring. Is that also done in Iceland? Oh man, I was totally going to say poutine. Beaten. oh poutine is from quebec. nom. Downvote: You answer was common sense, but not truly an answer to the actual question. Traditional dishes include H? ?karl (putrefied shark), graflax (salmon marinated in salt and dill), hangikj? ?t (smoked lamb), hr? ?tspungar (pickled ram's testicles), and sl? ?tur (sausages made from sheep entrails). A popular food is skyr made of cultured skim milk, in the summer time it may be served with bilberries as a dessert. Dried fish is also really popular, and it's eaten with butter (butter in Iceland is the best.) When I go, the farthest from paleo I stray is sl? ?tur, which is either blood pudding (fat, oatmeal, blood) or liver sausage. Mmmmm. The English have historically been ridiculed for their 'meat and two veg' approach to food by other European countries who believed they had a more sophisticated culinary tastes. In recent years the UK has given rise to several 'celebrity chefs' and experienced an explosion in gastro-pubs. But for me, 'meat and two veg' IS paleo! The Full English breakfast is (largely) paleo-compliant, as is the traditional English Sunday Lunch. I'm Native American, my tribe used to harvest up to 10 tons of salmon per day according to one government official in a document in our local museum. My niece who is the pickiest eater and is not paleo at all (she lives on cold cereal most of the time) absolutely loves salmon. She even asks to eat the skin of anyone who doesn't partake, guess her body knows those omega threes are a necessity! 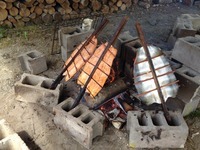 We cook it on sticks over the fire, smoked with Alder wood or wind-dried. I like all of the traditional methods as well as many modern recipes. My husband is Russian and his parents make a lot of paleo-friendly dishes. Boiled Beef tongue rubbed with raw garlic and unrefined sunflower oil (but I just altered it for myself with macademia nut oil or olive oil.) Thinly sliced cod livers with fresh raw farmer cheese, real borscht with a generous dollop of creme' fraise or European style sour cream, Green Borscht, When I go to their house we eat a ton of fresh salmon roe, wild salmon lox, all sorts of lacto fermented veggies, if you're not anti-rice on occasion stuffed cabbage is awesome, lamb-potato cakes are delish, and I loooooove Russian salads. All the goodies and none of the lettuce, hehehe. Tomato, radish, and cucumber with either a lemon juice and oil dressing or sourcream with dill is one of my favorites. SAURKRAUT BABY! I'm from Germany, and I grew up eating it....love it :) Also, plenty of sausages, and organ meats. In historical Canada people usually ate circular slices of ham which they called bacon, although these days people mostly call the strips bacon and the circular pork slices ham. Get some good quality pastured stuff and you're sold. Skip the pancakes, of course. Poutine has been mentioned too, which is good, although cheese isn't really strict paleo. It is ancestral and not a deadly food, though. i suppose you could consider some kinda poutine paleo. french fries with gravy and cheese on top could easily be made in a paleo friendly way. Potatoes are a recent addition acceptable to some here. A flour roux in many recipes is also new, as is barley or Guinness*. Skip those. *Have to admit, Guinness is too tempting for me. One very common dish in Finnish cuisine, Carelian Stew, in it's most common form is 100% paleo. Main ingredients are cubed of beef and pork, put in water with most commonly carrots, onions, s&p and bay leaves. Some variations might include lamb or different animal organs. It cooked in the oven in low heat for several hours or even overnight. Traditionally it is served with boiled or mashed potatoes. It's very common food in Finnish restaurants' and schools' lunch menus, but it is also a dish served on celebratory occasions, suchs as Christmas. Usually I prepare my own lunch to work, but I usually scout for paleo-friendly lunches in restaurants close to work, and Carelian Stew is always a safe choice. When it comes down to it, most all cuisines use very similar ingredients, but just change up spices and seasonings. I can take ground beef or pork and make it taste Thai, Chinese, Mexican, Moroccan, etc... just be varying the seasonings. And most often the differences are with unique endemic produce. It's also preparation and technique. If it's mostly meat/veg, any cuisine can be paleo-ized. I am Scots-Irish, but I have eaten Mexican food all my life and my daughter-in-law and grandson are Thai, so I am going to give answers for those cultures. There is lots of Paleo Mexican food. This is a recipe from Rick Bayless, who has promoted authentic Mexican food in the U.S.
Tom yum gai and tom kha gai are Thai soups that are Palao.